Our newsroom and the LIONS@frica Daily publication allow us to share ecosystem news, updates and resources while celebrating the leading public and private stakeholders that are enhancing the innovation ecosystems on the continent. The time has come for the regional ecosystem in North Africa to attain global relevance, and we are glad that the Kingdom of Morocco is hosting our Pan-African technology showcase over the next two years. At the Global Climate Action Summit, Cisco joined 20 other companies as part of the Step Up Declaration, a new alliance dedicated to harnessing the power of the 4th Industrial Revolution to reduce greenhouse gas emissions. The DEMO Africa Angel Investor Summit and Investor Round-tables will be happening a full day before the main event - at the Mogador Marina in Casablanca. Learn more about current technology players, ecosystem enablers and investors that are driving the continent's surge towards the 4th Industrial Revolution. DEMO Africa - Is Morocco a Startup Nation? Infrastructure development — Is Africa ready for change? Telcos as catalysts, or not? Is Hollywood ready for Africa? 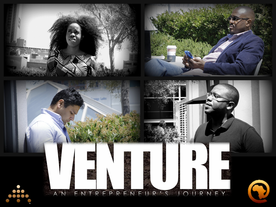 VENTURE: An Entrepreneur's Journey is a documentary film co-produced by the African Technology Foundation and the LIONS@FRICA initiative, that follows the entrepreneurial journeys of the four DEMO Africa winners. From the continent to Silicon Valley for the Global Entrepreneurship Summit, the film highlights each entrepreneur's unique experience as they work to scale their venture.